There are many different problems that can affect your retina, including retinal holes, degenerations and detachments. 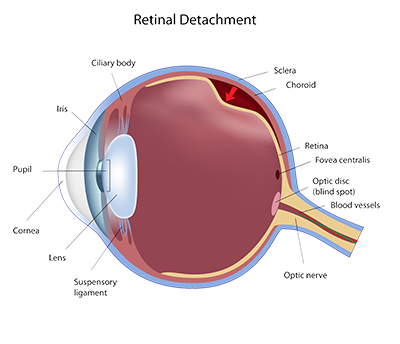 Retinal holes usually happen after trauma or can form in areas of the retina that are thin. People who are very nearsighted are at a higher risk for retinal problems, as their retinas are thinner overall. Some retinal holes do not produce any symptoms, and can monitored for any changes, as less than ten percent of holes lead to retinal detachment. If you have a hole with symptoms, or if it is in a more risky location, we will send you to a specialist who may laser the area around it to prevent any detachment. Retinal degenerations are usually noted during routine exams near the edges of your retina. They are more likely in near sighted people, and as we age. These degenerations can involve areas that are thinner than normal, more pigmented than normal, or less pigmented than normal. Some carry a higher risk of retinal detachments, and should be monitored at least yearly. Retinal detachments are a very serious problem, and require immediate attention and treatment. They occur when the retina pulls away from the back pack of the eye. When this happens, your vision is in serious danger, and with no treatment, vision is usually lost. If you ever experience flashing lights, sudden floaters, or a veil, curtain or shadow over any part of your vision, you should be seen immediately. If you do have a retinal detachment, you will be referred to a retinal surgeon as soon as possible to have it surgically repaired. How successful the repair is depends on how much and where the retina detached, and how soon it was repaired.